New version 2.2 is available for download. Android O (Oreo) supported, SDK version 27, no more deprecated code warnings. We made this beautiful Android UI template with idea to provide developers easy and practical way to make their apps also beautiful. With our Android UI template you don’t need to loose your precious time to set up pre-designed graphic – we did it for you! 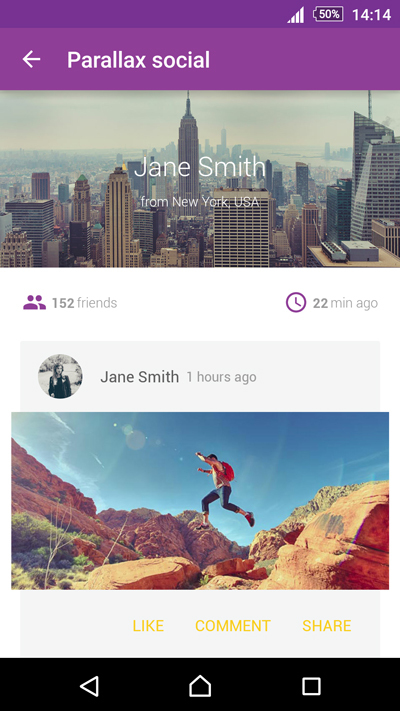 All elements are inspired with Android Material Design and created by their instructions. Also all elements are available to be used in older versions of Android so you don’t need to have expensive smartphone to have awesome Material design. You can easily implement components from Android UI template just by following our huge and well organized documentation. Your’s is just to code, we do the design. Easy as cake. Happy coding! Tabs – Five themes of tabs, and five new fragments, ready to use. Open Source projects used in this elements: Universal Image Loader, Pager Sliding Tab Strip. ListViews – Six versions of ListViews, like Expandable list, Drag&Drop, Swipe-to-dismiss, Appearance animation, Sticky list headers, Google Cards. All prepered for use in beautiful Material design style. Open Source projects used in this element: Universal Image Loader, Ken Burns View, Material Ripple Layout, List View Animations, Sticky List Headers, Animated Expandable List View. 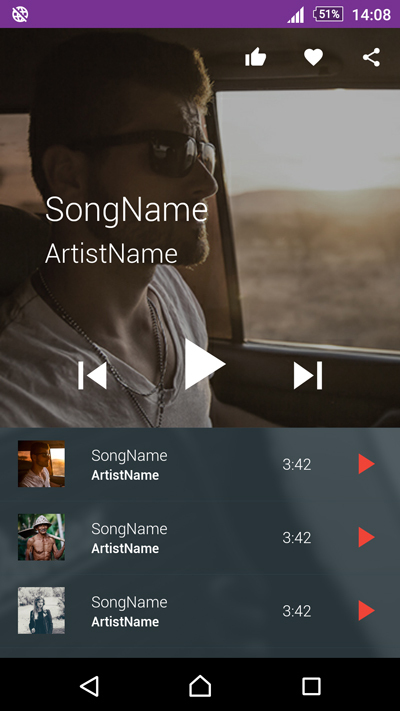 Left Menu – Two versions of left menu with Material design, ready to use. Open Source projects used: Universal Image Loader, Material Ripple Layout. Login Page – Login page in dark and light versions, with animated letters, ready to use. 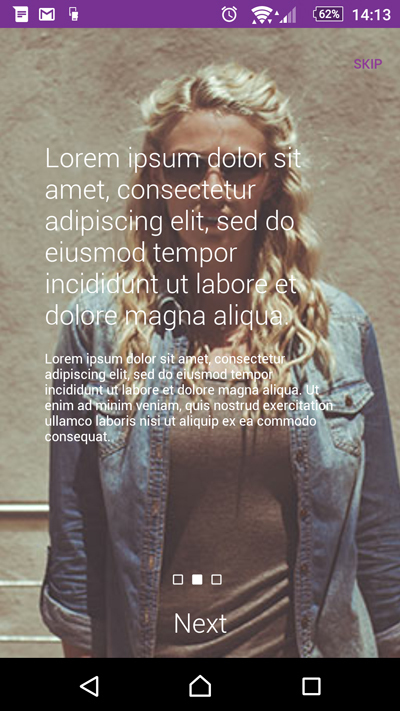 Open Source projects used: Float Labeled Text Field, Material Ripple Layout. Image Gallery – Two types of GridViews with images for gallery, with brand new design and beautiful selector. Open Source projects used: Universal Image Loader, Material Ripple Layout. Shape Image Views – Eight modern shapes of image views for your avatars, profile images etc.Open Source projects used: Universal Image Loader, Shape Image View. Progress Bars – 14 types of circular and button progress bars & loaders prepared for your app. Open Source projects used: Progress Wheel, Circular Progress Button. . 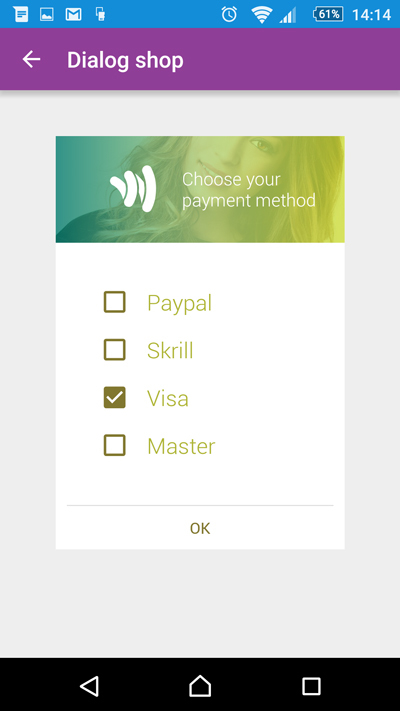 Check Buttons – Dark & light versions of check boxes inspired by Material design. Open Source projects used: Material Ripple Layout. Splash Screen – Three versions of beautiful designed and animated splash screen. Open Source projects used: Universal Image Loader, Ken Burns View. 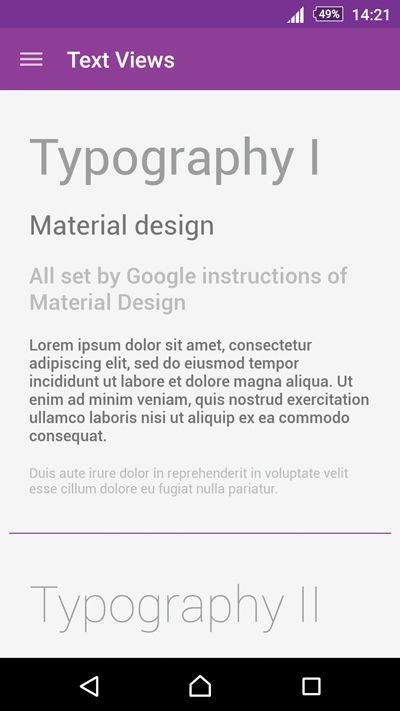 Text views – Prepared typography by Google instructions for TextView. 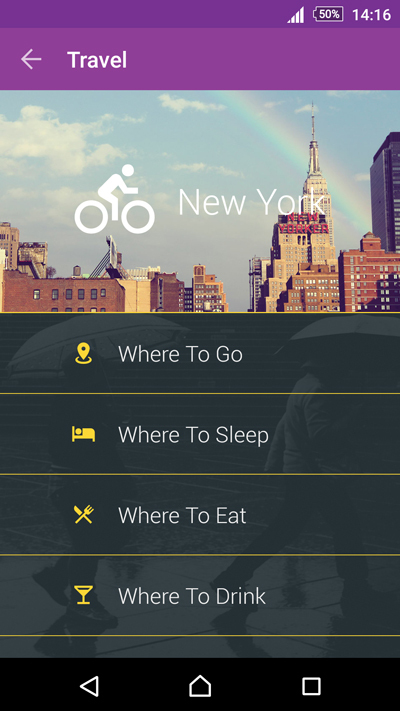 Search bars – Dark & light search bar with search suggestions prepared to place in your app. Open Source projects used: Material Ripple Layout. Icons – a wide range of free Fontello icons. Icons are added via Fontello – no more four different sized PNGs. In our project is 46 icon in .svg format. 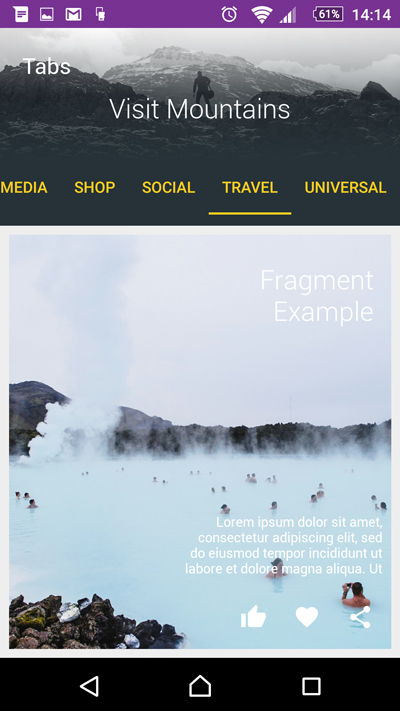 Unified graphic – all graphic elements are inspired by Android Lollipop Material Design. 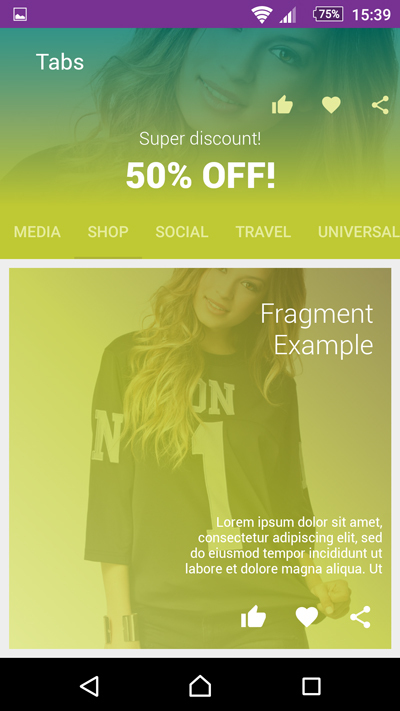 All elements prepared in one color style to complete your app. Easy colors changing – colors are changeable in one XML and primary color for all layouts and elements are changeable in one line. Finished elements and layouts ready to use – ready XML files and drawables for use in your app. Many elements have animation and/or transparency – beautiful transparent animations which are more and more popular. All elements and layouts work on old versions of Android (from 4.4 version) too – every element has its own AndroidMainfest.xml file with defined minSDK. Define typefaces and fonts through XMLs – no more need to create fonts from assets folder. Universal Image Loader – link – Used for effective image loading. Take a look at library for more details. Pager Sliding Tab Strip – link – This project is used to make items in Tab category. Ken Burns View – link – Extended ImageView that is capable of showing Ken Burns Effect. Progress Wheel – link – Progress bar. Circular Progress Button – link – Yet another example of a progress bar. Float Labeled Text Field – link – This project allows us to show hint text above edit text when we start typing. This might be useful when you have prepopulated Edit Text fields, or when you have a large number of them to show user what is purpose of every Edit Text field. Material Ripple Layout – link – We use this project to bring Material design ripple effect to api levels lower then Lollipop API level (pre-21). If you want to get ripple effect, add MaterialRippleLayout to your xml layout, then nest you own views into it. Pull Zoom View – link – This project allows us to show parallax effect with image that is attached on top of ListView or ScrollView. You can see an example by clicking the link of project. Not Boring ActionBar – link – Take a look at this link for more details. Shape Image View – link – This project allows us to create different shapes around images using ImageViews. Visit link for more information. List View Animations – link – For the most beautiful animations you want with your ListView items, use this project. To use this project with Sticky List Headers, use project below (Sticky List Headers). Sticky List Headers – link – Sticky list headers project allows you to have headers drown above ListView (like the ones you have in Instagram application). For more information, take a look at a the link. Animated Expandable List View – link – This project is used to animate expanded list items in ExpandableListView. Thank you for renaming the app.. great support ! thumbsup. Dear Developer, I recently bought this awesome app. It’s working Thanks a lot mate. You guys are the best!! Fantastic, thanks. I’m sure I’ll be buying more sources from you. Sounds good, thanks. I’m now waiting for the update. Cheers. I am satisfied mate.. Thanks. Nice working with you. It worked – Brilliant. Thanks a lot. I love Features and Design. The only thing I would love to see added in the next update is so that when viewing photos (swiping) the three tabs (or buttons) at the bottom no to move only the picture. We are offering FREE SUPERB after sales support around. We care about your apps as much as you and we will help you in any way possible. FREE Lifetime Updates – get all the new features we add in each future update for free. Once you purchase, you can use our dedicated support where we quickly answer your questions. Includes great online documentation you can find and its constantly being updated with new material. Basic tutorials for newcomers about importing our template to Android Studio. Working hours: 09:00 – 16:00h, UTC+01:00. From Monday to Friday. Tabs – added five categories (Media, Shop, Social, Travel and Universal) of tabs and added five new fragments. Wizards – added five categories (Media, Shop, Social, Travel and Universal) of wizards and added five new fragments. Custom Dialogs – added six categories of dialogs (Media, Shop, Social, Travel, Universal Info and Universal Warrning). The images used in demos are not included in the downloaded ZIP file. All images belong to their rightful owners. Full lists of credits are here.